Dédé Oetomo finished his PhD in Linguistics and Southeast Asian Studies at Cornell University (1984). In March 1982 he helped found Indonesia’s first organization for homosexuals, Lambda Indonesia (1982-1986). He is also co-founder (1987) and a member of the board of trustees of GAYa NUSANTARA Foundation. Since 2004 he is an advisor to the South and Southeast Asia Resource Centre on Sexuality. 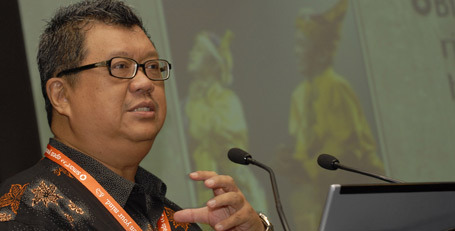 Since 2007 he is also a member of the Interim Governing Board of the Asia-Pacific Coalition on Male Sexual Health (APCOM), and currently an advisor to the Indonesian Network of Gay Men, Transgenders and Other MSM as well as member of the Working Group on Gay Men, Transgenders and Other MSM at the National AIDS Commission. In 1998 he received the Felipa de Souza Award from the International Gay and Lesbian Human Rights Commission and in 2001 the Utopia Award for Pioneering Gay Work in Asia. Academically, he is a Special Reader at the Faculty of Economics of the University of Surabaya. In this capacity he is a member of the Indonesian HIV Research Core Team.